Ginger Lemonade is an outstanding refreshing summer drink! It is easy to prepare and always a hit! 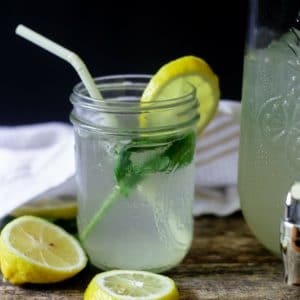 What takes this homemade ginger lemonade recipe take it up a notch is the addition of a fresh ginger and mint simple syrup. 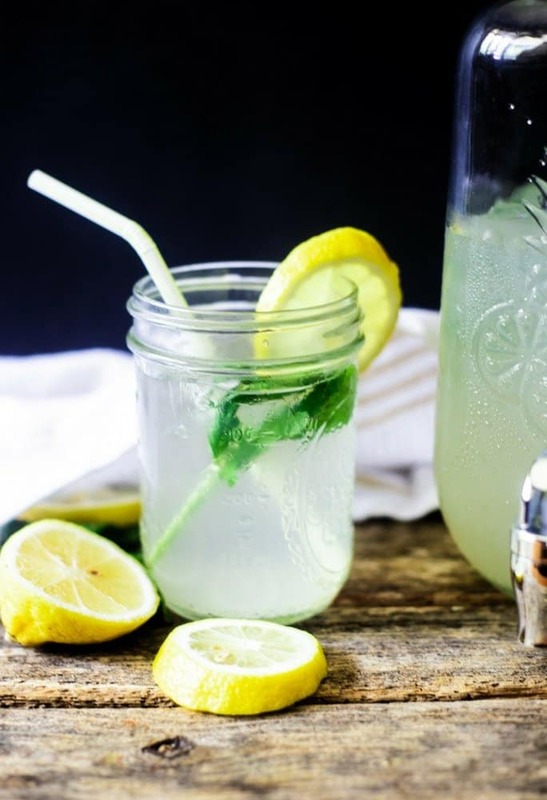 Enjoy this thirst quenching mint ginger lemonade recipe all summer long! Make and enjoy homemade lemonade because it is easy and so much tastier than buying any type of powder to mix, yuck! Those are all full of preservatives and a crazy amount of sugar. 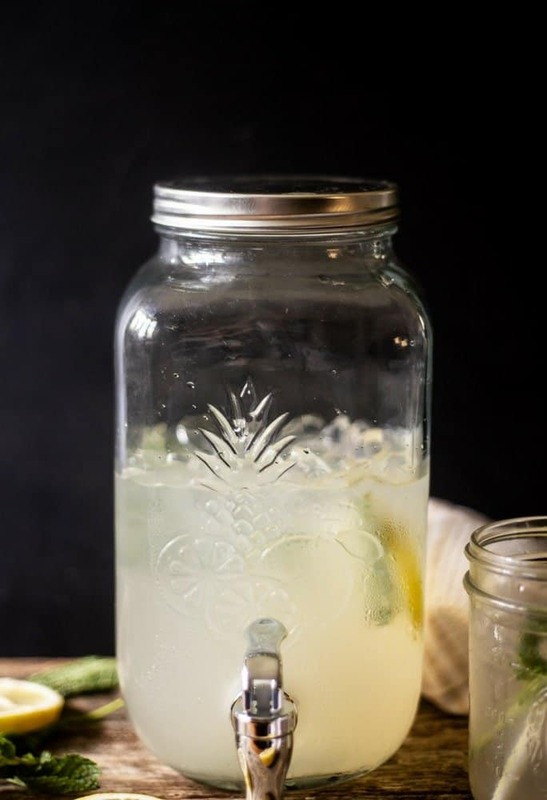 Fresh mint ginger lemonade is full of antioxidants and so good for the body. 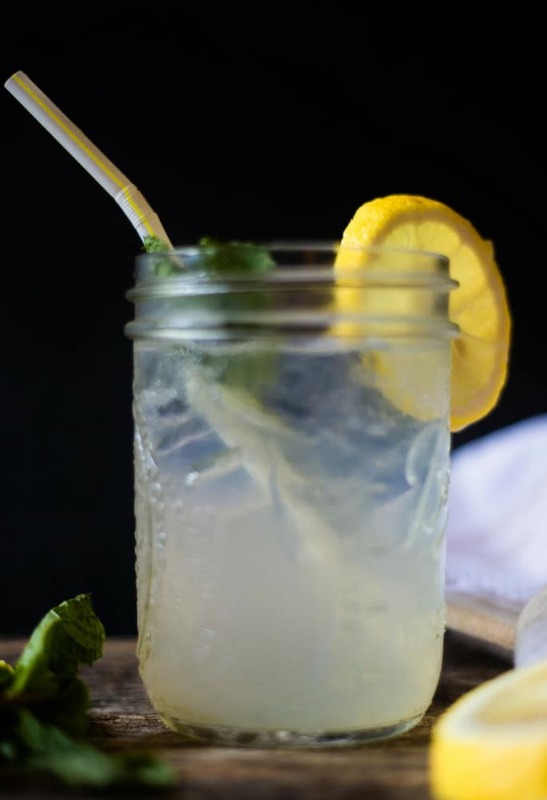 This ginger lemonade is made with fresh lemon juice, mint, ginger and sugar. For those following a keto or low-carb diet, use stevia for the sweetener. When I create a recipe, in general, I try to ensure that there is a health benefit to many of the ingredients. I am a ginger fan and many of you are too as Detox Lemon Ginger Tea is one of my most popular recipes! It is also my daily morning drink! Then, of course, there is lemon and mint! How does ginger benefit us in Mint Ginger Lemonade? Ginger is full of antioxidants and aids in blood circulation which helps the skin. Ginger is an anti-inflammatory, aids in digestion…I could go on and on! What are the benefits of adding mint to Ginger Lemonade? Yes. Mint is a herb that is awesome for an upset stomach and the digestive system. It is also good to aid in naturally balancing cholesterol so through it into your cooking whenever you can. one of my favorite recipes using mint is Cauliflower Tabbouleh! Can you make Ginger Lemonade or Homemade Lemonade with honey? Yes, you can use honey to make lemonade. I generally start with 1/4 cup of pure honey with this recipe. I taste and adjust honey if needed. How do you make Homemade Lemonade without sugar? When I want a sugar-free alternative to Homemade Lemonade, I use stevia. This is a great alternative to sugar and for those who are low-carb or practice a Keto lifestyle, this is perfect. Can bottled lemon juice be used to make ginger lemonade? Here is the thing with bottled juice, you have to check the labels. You would want to use bottled pure lemon juice, without added sugars. I prefer using fresh lemon juice. Below is an easy way to always keep lemon juice in the freezer. How do you freeze fresh lemon juice? To ensure you always have lemon juice or when the price is very low for lemons. Juice your lemons into a bowl. Use an ice-cube tray and place the juice in each cube, about 2 Tablespoons each. Freeze the juice until frozen. Place the cubes into a freezer bag and use as needed for fresh lemon juice. Use the juice cubes within 6 months. Pour 1 cup of water into a small saucepan. Chop the ginger into thin slices, it is not necessary to peel the ginger. Place the ginger into the saucepan. Use 1/2 of one of the squeezed lemons to toss into the saucepan. Add 1/4 cup of sugar or stevia into the saucepan. Add the 1/4 cup of mint leaves into the saucepan. Warm over medium heat until it boils. Remove from heat, place lid on the saucepan and let steep for 30 minutes to 1 hour. After the syrup has set, strain the liquid and discard the mint, ginger, and lemon piece. Set mint ginger syrup aside. Squeeze the lemons to make 1 cup of lemon juice, 4-5 lemons. In a large pitcher, pour the mint lemon syrup into the pitcher and add in the lemon juice. Serve with fresh mint and a lemon slice, enjoy! 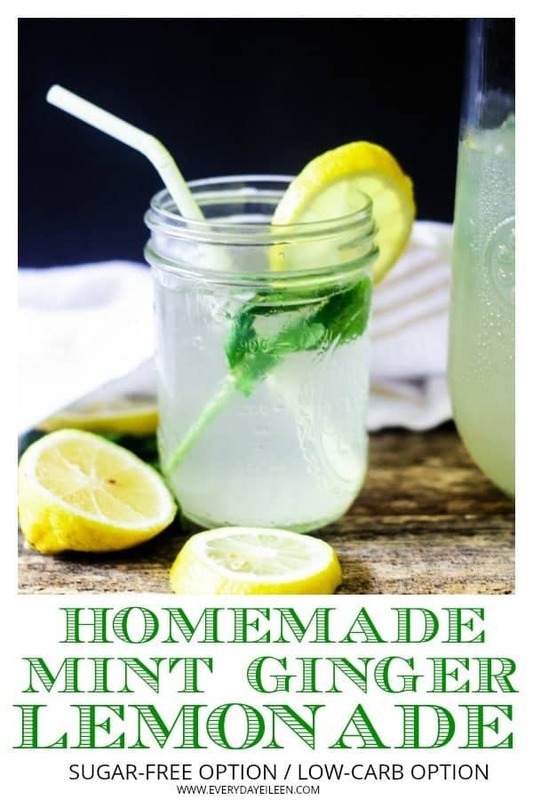 If you have enjoyed this homemade mint ginger lemonade, giving it a 5-star rating and share comments below would be super helpful! Homemade lemonade is a fantastic thirst quencher. For this lemonade, adding a mint ginger syrup puts this over the top delicious! 1/2 lemon shell, use the juice in the lemon juice. In a small saucepan, over medium heat, add the water, sliced ginger, sugar, mint, and lemon shell. Bring the mixture to a boil, remove from heat. Cover with a lid and let steep at least 1/2 hour. Set aside. In a large pitcher, combine the ginger mint syrup and lemon juice. Mix well. Add in the water and mix well. Add in the ice. Serve with fresh mint and lemon wedges. Note 1: Depending on your dietary needs, Stevia can be used for Keto and low-carb. Honey, pure maple syrup or coconut sugar can also be used. Note 2: No need to peel the ginger. Just slice it thin and I even break those in half to release the ginger flavor. Note 2A: I love ginger so I tend to add 3-4 ounces. Start with the lower amount and you can always add more ginger. any nutritional data I provide is an approximation and any actual dietary information can vary based on ingredients and proportion sizes. We are finishing up #FarmersMarketWeek and I have really enjoyed my fellow food bloggers recipes. I want to thank Ellen from Family Around the Table for hosting this event this year! You can check my recipes Vegetable Lasagna Stuffed Zucchini Boats and Easy Gazpacho Soup Recipe and they have a link to all the recipes from Monday and Wednesday! You can search Tuesday/Thursday recipes by using #FarmersMarketWeek! absolutely fresh and looking delicious… Must have to try this lemonade… Thank you so much Eileen!!! Awesome Nisha! I hope you enjoyed the lemonade! Thanks for this! I made this for my wife and she loved it! Excellent Andy! I am so happy your wife enjoyed the lemonade! Thank you Deirdre! I am thrilled! Awesome Deirdre! This is a keeper! I love that you use the lemon shell to make the simple syrup! Great way to use the whole lemon. Your recipe sounds refreshing! Wow! This is really good and refreshing. The mint and ginger was a great addition to my ordinary lemonade. I love it. I love this lemonade also Sheila. I agree, the ginger and mint put this over the top delicious and the nutritional value is super important. Enjoy the lemonade. So cool and refreshing on a hot day! Thank you Ellen, I hope you enjoy! This sounds soo refreshing. I also use Stevia as a sugar substitute in my recipes! Wow this sounds sooo refreshing. I also use Stevia as a sugar substitute! Awesome Leslie! Glad you like the lemonade and Stevia is a great substitute! What a refreshing beverage! I will be shopping tomorrow for the ingredients, and I am looking forward to trying this! YUM! How refreshing! And I love that you bumped up the health benefits by adding mint and ginger. This is such a refreshing combination of ingredients. Just perfect to sip on a hot summer day! So refreshing for a summer afternoon! This looks so wonderfully refreshing, I’m a big fan of ginger and mint is always a great addition too. What a refreshing blend of flavors! I love the idea of this! That looks and sounds so refreshing, perfect after a hot and muggy day like today! This sounds so refreshing and delicious. I was drinking ginger water today. I’ll have to try this lemonade! Lemon and ginger go so well together and with all that yummy goodness you forget that it is actually good for you.